You can check the status of your ordered books by accessing ‘My Order’ from the top menu after logging in to your user account. CAN I AMEND THE QUANTITY ORDERED? We regret that no amendments can be made to a submitted order. Orders may be cancelled due to our suppliers running out of stock, a book being out of print, or your credit card transaction being rejected. You will receive call from our Customer Service regarding the cancellation. HOW WILL I BE REFUNDED FOR MY CANCELLED ITEM(S) / ORDER? You will be charged only when your order is completed and ready to be dispatched. After completing your order, make sure the page shows your order number. You can review your order by accessing ‘My Order’. You can pay via credit card, debit card or online-banking. If you receive an SMS from your Credit Card company, this only means that your issuing card has given verification to the seller, but the amount is not debited yet. If you cannot find the related order in “My Order”, or the items are still in your shopping cart, this means that there could be issues leading to a failed transaction. In such instances, POPULAR Online will not debit money from your bank. You can redo the payment procedure for items in your shopping cart. Rest assured that this will not result in double payment. ARE ALL CREDIT CARDS ACCEPTED? 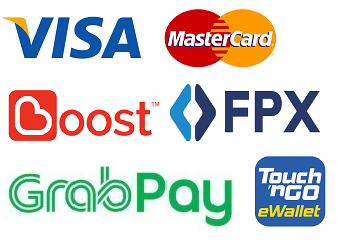 At present, we only accept VISA, MASTER and DEBIT cards issued by Malaysian or Singaporean banks. IF MY ORDER IS ALREADY COMPLETED, CAN I STILL CHANGE TO ANOTHER PAYMENT METHOD? Different payment methods are processed by different systems, so you cannot change the payment method directly. Instead, you can call our customer service to cancel the order, and then proceed to re-order. Your OTP is a password that is valid for only one login session or transaction, on a computer system or a digital device. A password will be sent to the registered phone number of card holders. It is generated randomly. Hackers will not be able to abuse the password since it cannot be predicted, is not repetitive and is only valid for a brief period. The OTP prevents users' passwords from being duplicated, and avoids the inconvenience caused by lost passwords. WHEN PAYING BY CREDIT CARD ONLINE, “ALREADY VERIFIED. THE ORDER IS YET TO BE COMPLETED” APPEARS. When members close the website window or their internet connection is disrupted while sending out their credit card information or awaiting verification, the system will not complete the order. So, although the order amount is verified by the bank, POPULAR Online will not debit the amount from the bank. Please redo the payment procedure for the items in your shopping cart, in order to complete the order. Rest assured that this will not result in double payment. You will be charged only when your order is completed and the products ordered are in-stock.